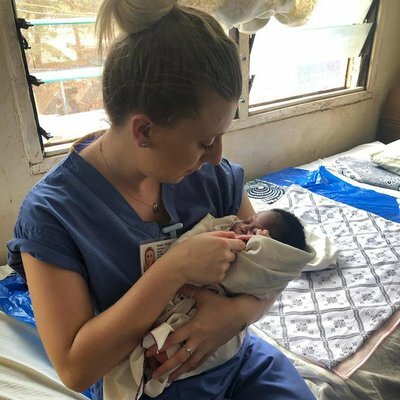 I arrived in Sri Lanka at 4am after an 11 hour flight and was greeted by the Programme Manager with a big smile and bottle of cold water – it was 30 degrees, I had not expected this wearing my jeans and the blue WTW t-shirt. After sleeping the flight off by the beach in Negombo, we got on a train to Kandy. The journey was quite long but the train passed beautiful scenery - field pastures and a deep mountain valley...stunning! Upon arrival in Kandy it was quite late, so we had some food at a Chinese restaurant (where the Sri Lankan cricket captain happened to be dining!) and soon after jumped on a tuk tuk up the hill to the house as the need for sleep was overcoming. The next day I had my official introduction and tour of the hospital that turned out to be a day’s work! I stayed in one of the maternity labour rooms and being a final year student midwife I saw a lot. I got past the language barrier with a lot of smiling and doing what I could to help. My first observation was that women laboured silently - a culture shock compared to the UK. During my time working I learnt many things from different midwives and nurses alike. 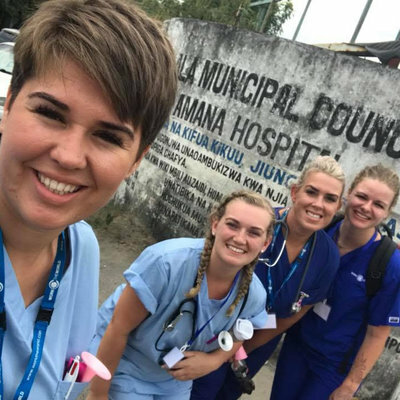 I became friends with the local students and my mentor – a local, qualified midwife – was fantastic! She spoke fluent English and liked interpreting to all the staff and patients. 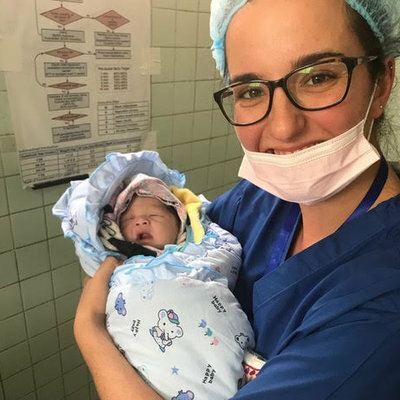 I learnt the obstetric phrases and basic language quite quickly which really helped with communication. On my last day I was looking after a woman in labour when I noticed something was wrong. I took her observations and quickly diagnosed the woman with pyrexia in labour and a medical student put up fluids and gave her paracetamol. The woman was frightened and asked me to stay – the only English word that she said. An hour later, I delivered the woman’s baby- the most unforgettable delivery I have experienced to date. It made me realise how lucky we are back home. Every baby and mother had matching number bracelets for identification and babies slept in a shared cot until mothers were ready to feed. The labour wards were always very busy with lots of activity and it was different to see nurses at deliveries; their teamwork was second to none. The hospital in Kandy is a teaching hospital in which donations are given which contribute towards new facilities and vital treatments. One of the most memorable times working at the hospital was when I was told there was a Dengue fever outbreak, this is fortunately not common. Safety procedures included spraying the hospital with insecticide to kill mosquitoes. The doctor’s mess was a canteen in the hospital where we ate lunch. The curries were very tasty and spicy, as one expects! I brought in cake for a tea break on my last day, after 3 and a half weeks it was sad to say goodbye. The nurses and midwives were so friendly and kind that it didn’t take long until I felt like I was a part of the workplace. The placement enriched my experience of midwifery and professionalism. The most important thing I did was to get involved and show my enthusiasm. I felt my experience here was such an eye opener – what every elective should be. Many of my evenings were enjoyed lounging at the house with newly made friends, having drinks in town and visiting small temples. During my stay in Sri Lanka, the friends I made at the hospital took me on day trips to the Botanical Gardens and around Kandy. I also went to Trinco; the beaches there were amazing and diving also great! I won’t forget waking for sunrise to see fishermen bringing in their night catches and cows roaming the beach. The elephants are a must see! I would recommend making a day trip to the orphanage and taking lunch. Beaches in the south are quite a long drive away, but it is cheap if you get a minivan driver known by WTW house staff. When I went with a group of 6 students we stayed at Gecko guesthouse in Arugam Bay by the beach. It’s owned by a really friendly English lady and her husband, it was great value and the food was amazing. Sunbathing and boating are a must; you can also surf when waves are favourable. If you want to see some cultural entertainment, traditional Kandyan dancing is available in town a short distance from the WTW house. As well as the dancing and drumming you can witness men walking on hot coals. The temple of the tooth is also definitely worth going to. On my last day I went white water rafting with a small group – well worth it! Luckily, I had been before as it was intermediate level that day. We jumped out of the raft after clearing the rapids and swam/drifted back to land. There are endless places to visit in Sri Lanka. If you choose to go here you are bound to make friends and future travelling buddies. Ladies, don’t forget to buy yourselves a beautiful sari from one of the many fabric shops in town. If you haggle with the vendor you can get a really good price! Sri Lanka really is a land like no other. Ayubowan..... May you live more!